OPEC's president says the group is not a secretive cartel. The Organization of the Petroleum Exporting Countries (OPEC) is not a ‘cartel’ or a ‘secretive’ group, President and the United Arab Emirates Minister of Energy and Industry Suhail Mohamed Al Mazrouei says. “We can assure you that as a group, we are not secretive [and] have nothing to hide,” Mazrouei told oil and gas delegates at the IP Week conference held in London, which was attended by Rigzone. “To the contrary, we are forthcoming to work with anyone to better the world economy and to help in maintaining the market balance,” he added. Looking ahead, Mazrouei confirmed at the event that OPEC wants to continue working together with Russia and other non-OPEC countries. The group has been collaborating with non-OPEC oil producing countries on output cuts since the end of 2016 in an attempt to tackle the recent oil price downturn. “There is an aspiration, definitely, by myself as a president of the organization for this year and also by the secretary general [Mohammad Sanusi Barkindo], to try to put a framework around how are we going to continue working together,” Mazrouei said. The OPEC president revealed that a framework is currently in draft form but nothing was ready to be shared yet. “We are hoping that we can discuss it with the ministers and hopefully finalize it during this year, but even if it takes more time to do it, I think there is more potential,” Mazrouei said. “I think if we can achieve it, it will strengthen the group … We are a group of responsible producers and we would like to work with everyone to achieve the market stability for better economic growth for the whole world,” he added. And what about inviting the United States to join the group, a delegate asked Mazrouei, followed by chuckles from the audience. “We are open to any producing country to join, but I think you could recognize how difficult it is for the United States,” Mazrouei responded. “In the United States there are … so many companies actually producing and it’s very difficult to put them under one umbrella, not to mention legally how difficult that is to be achieved,” he added. 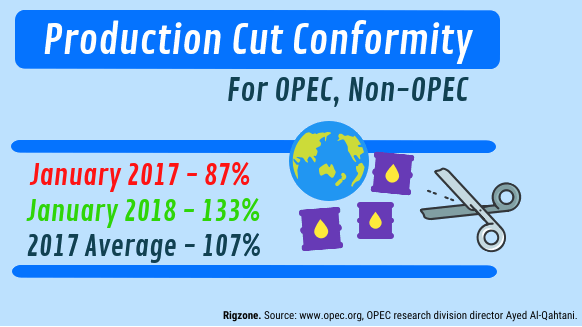 Following the declaration of cooperation made at the joint OPEC and non-OPEC producing countries’ ministerial meeting held Dec. 10, 2016, which saw producers on both sides agree to voluntary output cuts, OPEC has regularly reported on conformity levels among participants. These levels are shown to have increased on a monthly basis, from 87 percent in January 2017 to 133 percent in January 2018. The average conformity level for 2017 was 107 percent. “If you look at 2017, it was the first year that this group [worked] together. We delivered more than 100 percent … of the conformity levels that we were targeting,” Mazrouei said.